The current low yield environment generates considerable anxiety about the bond market. Some of this reflects the reality that it is more entertaining to read articles predicting doom. However, my suspicion is that this reflect the fact that the consol pricing formula is one of the few things people remember about fixed income pricing. With an infinite maturity, such instruments become quite valuable as interest rates fall. 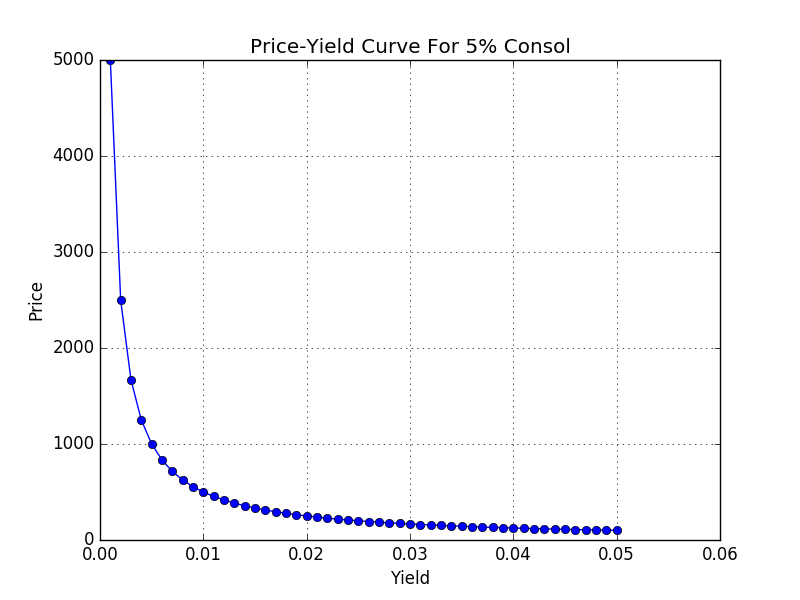 The figure above shows the price/yield relationship for a 5% consol. (The chart above shows the raw yield convention used in my pricer, and .04 corresponds to 4%.) Such instruments exhibit a very strong zero lower bound: it would literally be impossible to buy them at 0%, as it would require an infinite amount of money. This expression obviously blows up as the yield goes to zero. The simplicity of this expression means that such instruments work their way into economic models. Unfortunately, they reinforce the mysticism around low interest rates. An alternative way of seeing this is looking at the duration of the bonds. 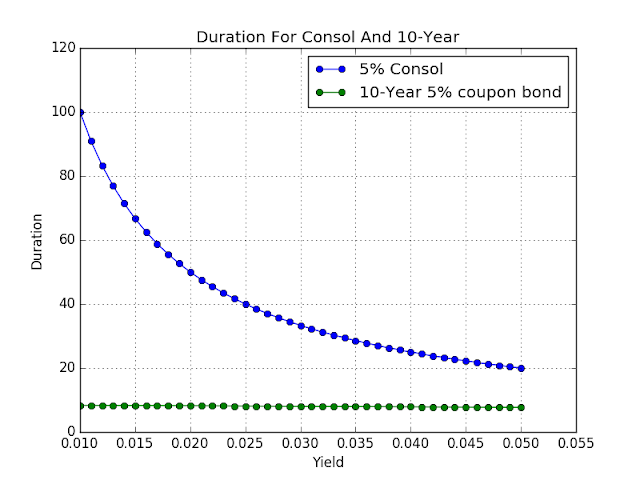 The usual definition for duration is that it is the return sensitivity of a bond with respect to interest rates. 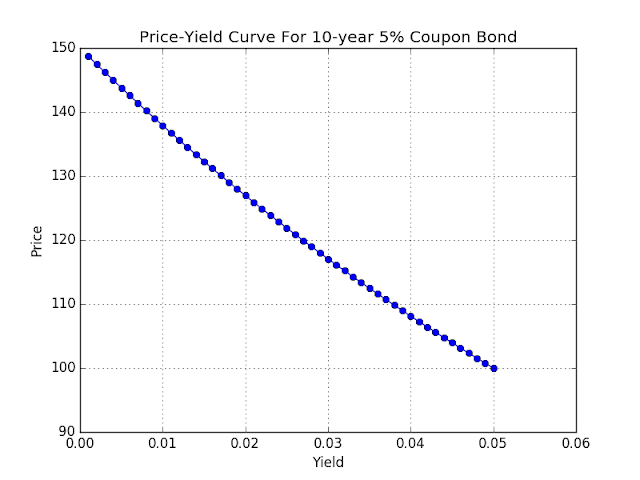 * For example, if the duration of a bond is 8, a 1 basis point rise in the bond yield will generate a capital loss of 8 basis points (loss as a percentage of market value, not versus the principal value). 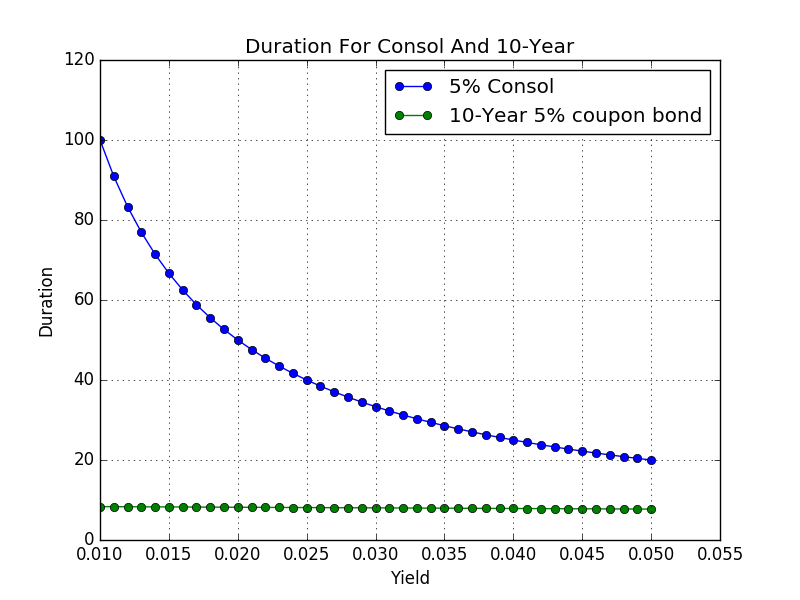 The duration of 10-year bond does move slightly (as shown below), but it is a flat line relative to the duration of the consol. (UPDATED) I was asked in the comments whether extending the maturity greatly changes the picture. 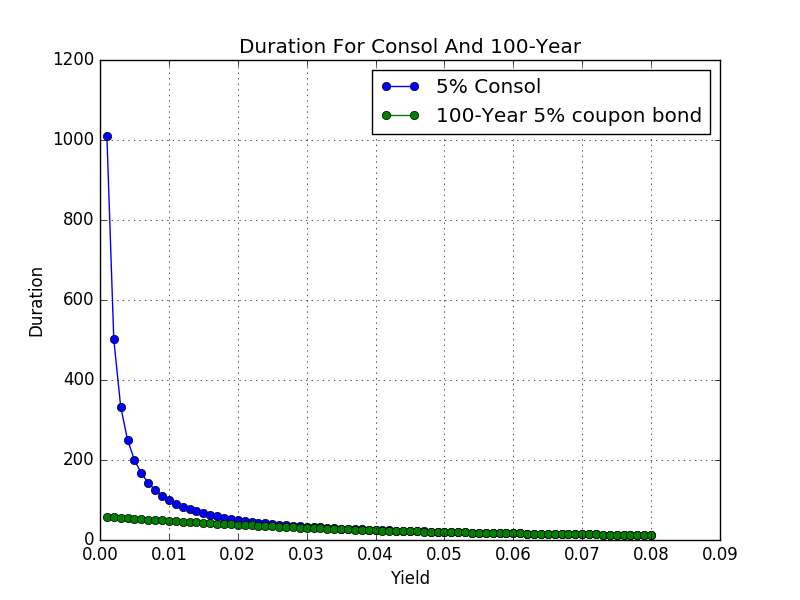 As the figure above shows, even if we go out to a 100-year maturity, the duration of a coupon bond looks fairly flat when compared to a consol. 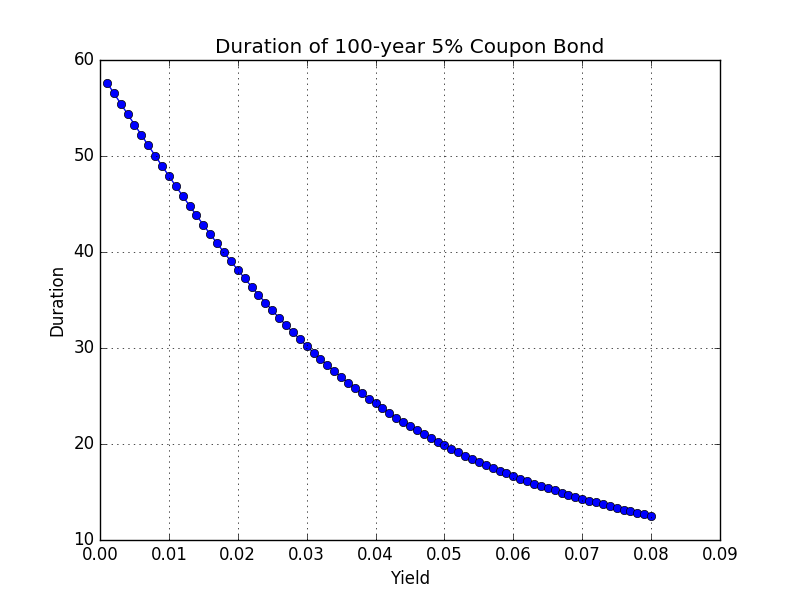 If we just focus on the 100-year bond (figure above), we see that the duration does roughly double when it goes from 3% to 0%, but it also roughly doubled when it goes from 6% to 3%. In other words, the shift in duration (which fixed income investors are used to managing) is not greatly disjointed when compared to the experience with higher yields. 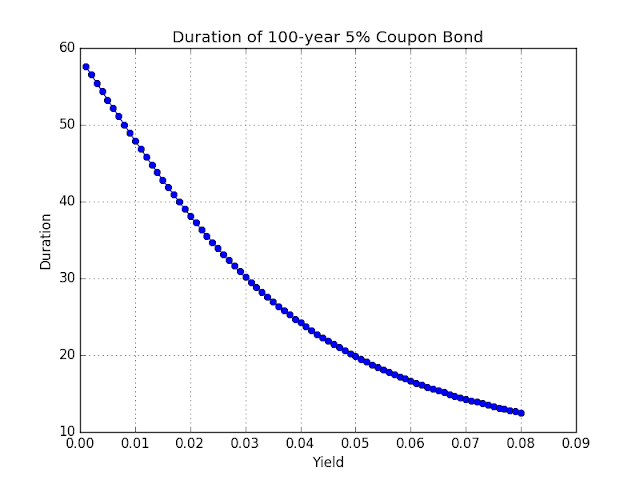 Furthermore, we need to keep in mind that the duration of bonds outstanding is a lot closer to that of a 10-year than a 100-year (the aggregate duration depends upon the issuance patterns of the country in question). Therefore, the duration profile that investors are dealing with is a lot closer to the chart of the 10-year than the 100 year. Although it might seem that a 100-year bond is effectively the same thing as a consol, this is not true at ultralow interest rates. 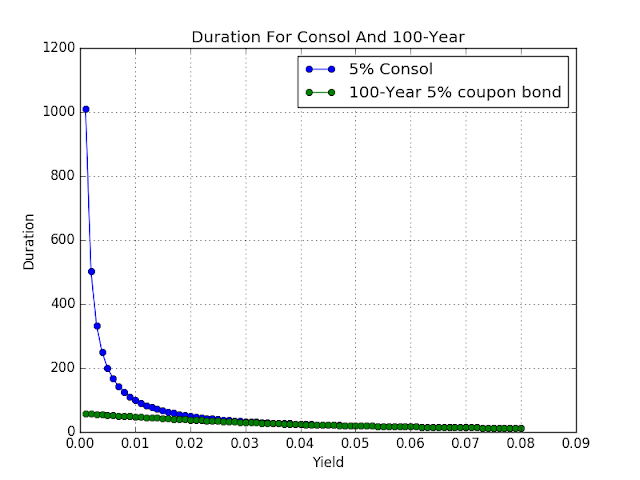 For a 5% consol, the present value of the first 100 years of coupons is $500, while the price of the consol at a yield of 0.1% was $5000. That is, (about) 90% of the discounted value of a consol at a 0.1% yield comes from cash flows that are coming more than 100 years in the future. Although the duration of bond portfolios lengthen slightly in a low rate environment, the effect only matters if you are extremely concerned about micromanaging your duration risk (which most bond managers do). However, from the perspective of macro asset allocation, the risk posed by rate changes at low interest rates are similar to the risk posed by the same changes when yields are higher. During selloffs, the U.S. bond market has historically been wracked by mortgage convexity hedging. The embedded call option in mortgages means that their duration can move much more dramatically than option-free bonds (sometimes called linear bonds). These blowups also contribute to the mythology around rising yields. I will not that I am out of touch with the U.S. mortgage market, and so my comments here are only a guess. That disclaimer aside, I have my doubts that this effect is going to be as important going forward as was the case during previous bond bear markets. The collapse of consumer lending institutions after the crisis has made mortgage refinancing less automatic, and the holders of mortgage portfolios seem to be less aggressive in their hedging strategies. In any event, what matters for mortgage hedging is the relationship between market mortgage rates and the rates on existing mortgages, and not the absolute level of interest rates. * An alternative duration measure is the Macaulay Duration. The Macaulay duration is the weighted average maturity of the cash flows of a bond (or portfolio), using the cash flow payment amounts as the weighting. (A $105 principal and final coupon payment has a weight of 150, while a coupon payment has a weight of 5.) A consol has an infinite Macaulay duration. The Macaulay duration does not depend upon the market price of securities, and so is easier to calculate an understand. For this reason, it sometimes shows up in annual reports of fixed income funds. For an individual bond, there is a formula linking it to the usual definition of duration. General comment: Brian, usually you do a good job explaining things in terms understandable to lay people. But in this case I think that you will only get through to readers with a knowledge of bonds that is at least a grade above knowing that interest rates and price move in opposite directions. If you want to talk to economists/MMT types I would suggest assuming that all they know is that price and yield move in opposite directions. By that criteria, the above post was very hard to follow. The point you are making is an important one. It might be worth giving another shot. A reference to Keynes' squares rule would be nice for the more advanced monetary economists in the Post-Keynesian/MMT community (this paper is relevant to the above discussion and I think Kregel would appreciate the engagement: https://core.ac.uk/download/pdf/9314366.pdf). Particular comment: you say that most of the fear about the bond market at ZIRP is dependent on people holding a theoretical concept (consol pricing formula) in their heads that is largely inapplicable to the real world. Point well taken. But let's try to put some numbers on this. How far would you need to go out on the curve to get consol convexity effects? I mean, obviously none will be as dramatic as actual perpetuals, but surely there are some fairly deep markets that do have somewhat dramatic effects. After we've answered that step the next step is: how deep are those markets and how much damage could they do? It also strikes me that there are some pretty crazy derivative products kicking around today. Cross currency basis swaps stand out. These seem to definitely be sensitive enough to interest rate moves that they could potentially blow their lid at some point. I'm also not all that convinced that every bond manager knows what they are playing with when they play with these things. I will take a look at the article complexity; thanks for the feedback. Compared to what I am used to reading about bonds, that was simple... The digression on mortgage convexity hedging was something only specialists would follow, but it comes up a lot. I should relegate it to an appendix. I will append some charts for longer-dated bonds ("soon"). The reason I chose the 10-year as 30-year yields are further away from 0%, and it reflects bond index duration. Also, the only people who allocate money to 30-year bonds in any size need the duration. The issue with cross-currency swaps is more interbank credit risk. During the Financial Crisis, a lot of foreign banks were shut out of USD funding markets, and they used cross currency swaps ("basis swaps", although there are other types of basis swaps) as a USD funding vehicle. I wrote about that some time ago. The way I learned it is that the duration of a security is the horizon at which the capital loss from a rate increase just cancels out the value of the higher yields. If your horizon is higher than your portfolio's duration, you are happy when rates rise; if your horizon is shorter than the duration, you are sad. Is that right? It would follow that the people most likely to suffer from low rates are the longest-horizons investors, presumably institutions like insurance companies or pension funds. But instead, the loudest complaints seem to come from professional traders, who I would naively think would be shorter-horizon and therefore more sensitive to the capital gains low rates generate on their existing portfolios. But maybe they are speaking for their principals? Also, Keynes' square rule implicitly assumes that interest rates cannot be negative. For the horizon idea, it works for small yield changes. 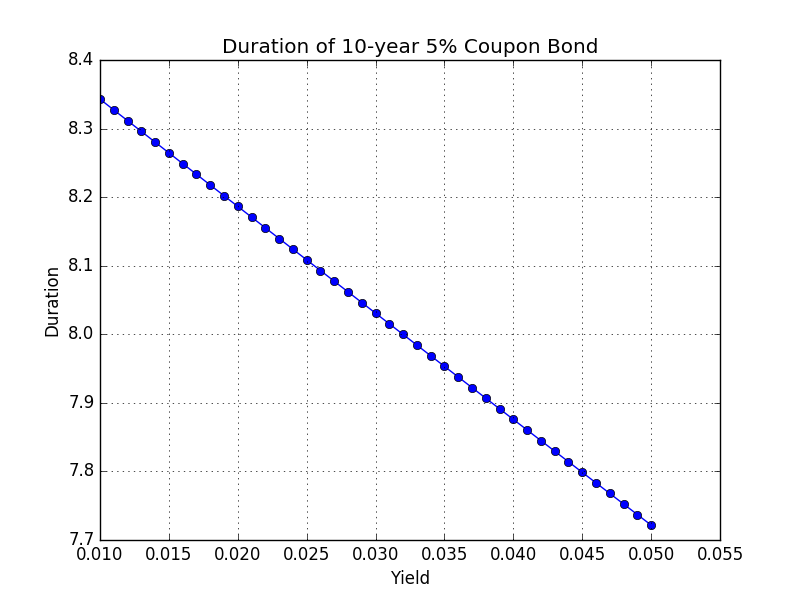 If you have a bond with a duration of 5, and the yield rises by 5 basis points, it would take 5 years for the extra carry of 1 basis point to cancel out the 5 basis point capital loss. For larger yield changes, the duration shifts as yields rise (admittedly not by a lot). Also, you would get extra interest on the extra interest for larger yield shifts. For example, if interest rates rise by 2%, you would get more than 10% more interest over 5 years. However, the level of rates is independent of that; that relationship is about the extra carry to match the capital loss. If the interest rate is 10%, the total interest income will cover a capital loss of 5 basis points in a few days. The short-term traders are always the loudest. But low yields are a disaster for institutions with high duration actuarial liabilities. You would be indifferent if you matched your asset duration to your liability duration, but very few North American pension funds did that. U.K. funds were pushed by regulation changes to match duration more, and they should be thankful.